When no one else was there to be his friend, he always had Beadie. A new home, a new school, starting over with zero friends, Connor (Tyler Williamson), has taken one thing to this new place that no one can ever take away from him, his stuffed animal Beadie. Scared to be alone at his first day of a new school, Connor stuffs Beadie away in his backpack to go with him. When a school bully tries to shred apart a friendship that can’t be broken, all is lost as friendship fights back. Let’s Be Friends is a horror short about the importance of friendship from UConn student director Ryan Glista. 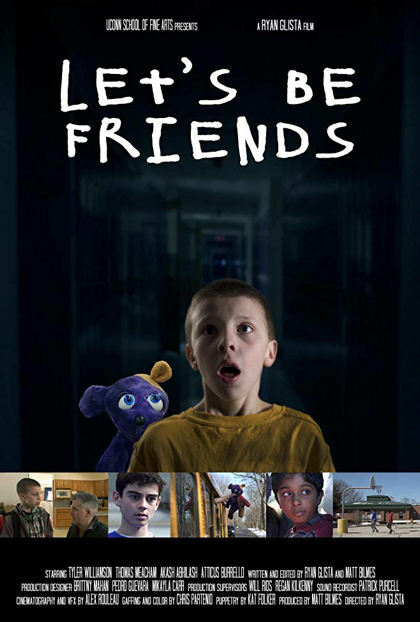 It explores childhood bullying in the form of stop-motion animation horror. A creepy little stuffed animal with the most adorable plastic eyes you’ll ever see make for a nice horror short about being alone, the coming of age of a friendship and cute and cuddly things coming to life and exacting revenge. Exposing the horror at The Boston Underground Film Festival, Let’s Be Friends is my personal horror short favorite. Stop motion animation wins with me every time.